UMass Lowell's mascot will be launching into orbit in the coming years, well, sort of. After the university received $200,000 from NASA, 53 students will begin work on a satellite set to blast off in 2018. 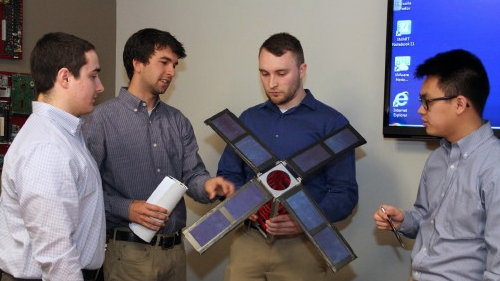 The name of the satellite to be built by these engineering and science students is "SPACE HAUC." The name of the satellite is pronounce like "space hawk," in honor of UMass Lowell's River Hawk mascot. The acronym stands for Space Program Around Communications Engineering with High-Achieving Undergraduate Cadres. Professor Supriya Chakrabarti, the UMass Lowell physics instructor who runs the Lowell Center for Space Science and Technology, will be leading the students. The name of the satellite is pronounce like "space hawk," in honor of UMass Lowell's River Hawks. Once the satellite is complete, NASA plans to launch the satellite into space on a year-long mission into orbit around Earth to test its ability to swiftly collect and transmit research data. SPACE HAUC will circle Earth about every 90 minutes at 17,000 miles per hour. The nine-pound satellite will measure about a foot in length and four inches in width and height. Four solar panels will power it. The proposal from UMass Lowell for this project received the maximum amount of funding through NASA's Undergraduate Student Instrument Project. This is not the first time NASA has worked with the university. The space agency is currently working with UMass Lowell robotics researchers to develop a "300-pound humanoid robot" for possible space exploration. The students involved in this project include Darrien Glasser and Dat Le (project manager) of Billerica; Rebecca Campelli and Stephen Kender of Chelmsford; Kevin Sargent and William Taylor of Dracut; David Paluzzi of Grafton; James Lynch of Groton; Jeffrey Cheng, William Kammerer and Jake Maguy of Leominster; Silverio Johnson, Sanjeev Mehta and Sean Webster of Lowell; Michael Zurawski of Tewksbury; and Eric Carey of Westford.